Get into the swing of summer with Samoa, easy on your feet and beautifully crafted with its metallic detailing and optimal combination of gilded style adds the perfect amount of flair enough for special days and evenings out. It’s easy to pair these not only scientifically proven to alleviate heel pain, pediatric designed orthotic footwear to your personal sense of elegant and stylish fashion. 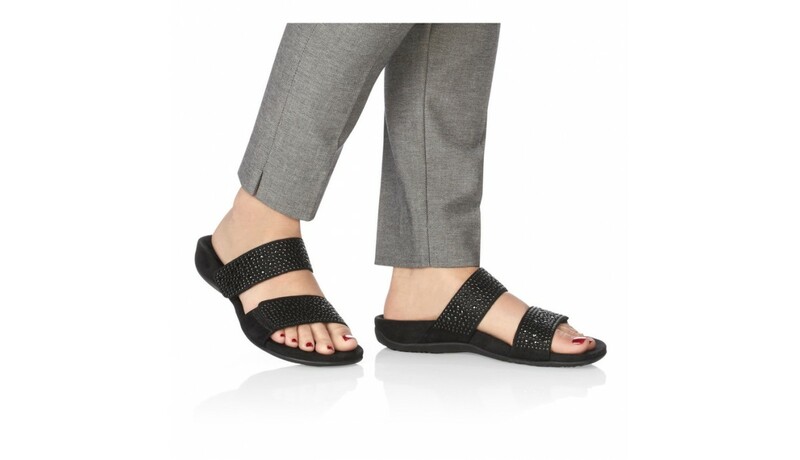 Be in style in the comfort of your Orthaheel hook-and-loop closure on the straps for perfect fit slide-on sandals by Vionic now. Microfiber-covered footbed with leather and textile upper. Flexible, lightweight EVA midsole absorbs shock, reducing stress on knees, ankles and feet. Patterned tread provides traction on a variety of surfaces durable rubber outsole. Renowned Dr. Andrew Weil recommended. Available in women's whole sizes in two widths MEDIUM & WIDE. Sizes 5-11 for medium width. Sizes 6-11 for wide width.